Sean Guynes is an editor, critic, and reviewer based in Ann Arbor, MI. He is Journals Coordinator at Michigan Publishing, University of Michigan and a PhD candidate in English at Michigan State University. His work focuses on the politics and industries of sff, horror, comics, and transmedia in postwar America. Unstable Masks: Whiteness and American Superhero Comics. Edited with Martin Lund. The Ohio State UP, forthcoming. New Suns: Race, Gender, and Sexuality in the Speculative. The Mingolaverse: Hellboy and the Comics Art of Mike Mignola. (As S.G. Hammond.) Sequart, 2019. 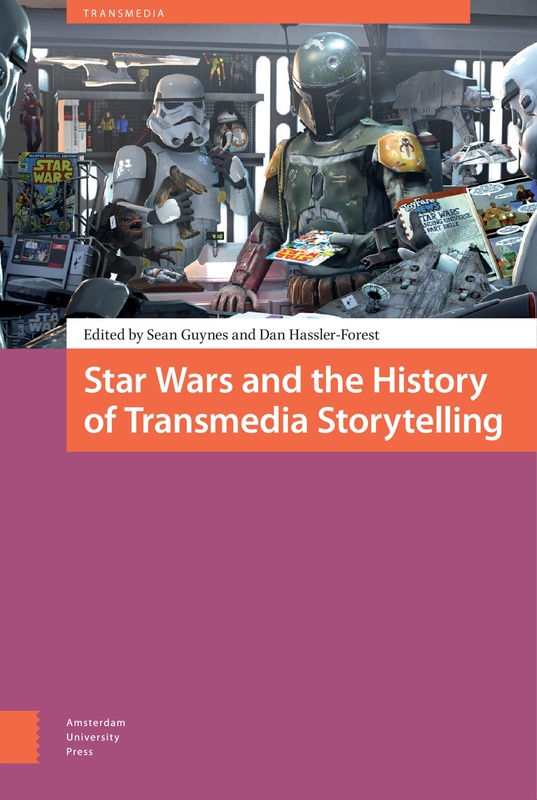 Star Wars and the History of Transmedia Storytelling. Edited with Dan Hassler-Forest. Amsterdam UP, 2017. Transmedia: Participatory Culture and Media Convergence 3. Punking Science Fiction. Special issue of Deletion, no. 14, May 2018. “Afrofuturism’s Specter: Alternate History, Racial Capitalism, and Nisi Shawl’s Everfair.” Worlding SF: Building, Inhabiting, and Understanding Science Fiction Universes, 6-8 Dec. 2018, Graz, Austria. “Figuring Race in 1950s Meta-Slave Science Fiction: Isaac Asimov, Frederik Pohl, Damon Knight.” Futures of American Studies Institute, 18-23 June 2018, Dartmouth College. “Chalmun’s Cantina: Transmedia Collaboration and the IP Farm in the Star Wars Franchise.” ICFA Annual Conference, 14-18 Mar. 2018, Orlando. “Supercyberpunk: Genre and Aesthetics in Batman: Digital Justice.” Michigan State University Comics Forum, 23-24 Feb. 2018, Michigan State University. “A Proposition for the Science Fiction Age: John Michel’s Popular Front.” Institutions, Markets, Speculations: Creative Economies of Science Fiction. MLA Annual Convention, 4-7 Jan. 2018, New York City. “Punking Science Fiction: Silkpunk and the Aesthetics of Generic Dissent.” Science Fiction as Dissent. ASA Annual Meeting, 9-12 Nov. 2017, Chicago. “Milestone Comics, Black Nationalism, and the Cosmopolitics of Static.” Michigan State University Comics Forum, 24-25 Feb. 2017, Michigan State University. “Franchise Anxieties, the Eighties Comic-Book Scene, and Crisis on Infinite Earths.” MPCA Annual Conference, 6-9 Oct. 2016, Hilton Rosemont / Chicago O’Hare, Chicago. “Trans Narrative and DC Comics’ Camelot 3000 (1982-1985).” Franchises and Economies of Contemporary Media. SCMS Annual Conference, 30 Mar.-3 Apr. 2016, Hilton, Atlanta. “Sexual Violence in Le Guin’s The Dispossessed: Toward an Interpretation.” English Graduate Organization Conference, 30-31 Oct. 2015, Ohio State University. “Toward a Periodization of Queer Visibility in American Comics.” Graduate Consortium of Women’s Studies Symposium, 28 Mar. 2015, MIT. “Green Arrow, Anti-Gay Violence, and Urban Space.” NEPCA Annual Conference, 24-25 Oct. 2014, Providence College. Nominated for Best Graduate Student Paper Prize. Organizer and chair, Stephen King at 45: Horror and the Mass Cultural Genre System. MLA Annual Convention, 3-6 Jan. 2019, Chicago. Organizer and chair, Cyberpunk Comics. Michigan State University Comics Forum, 23-24 Feb. 2018, Michigan State University. Organizer and chair, Institutions, Markets, Speculations: Creative Economies of Science Fiction. MLA Annual Convention, 4-7 Jan. 2018, New York City. Organizer and chair. Science Fiction as Dissent. ASA Annual Meeting, 9-12 Nov. 2017, Chicago. Organizer and chair, Science Fiction and the Limits of Counterculture. MLA Annual Convention, 5-8 Jan. 2017, Pennsylvania Convention Center, Philadelphia. Session speaker. “Science Fiction-Related Career Pathways in Media Studies.” SFRA Annual Conference, 21-24 June 2019, Honolulu. “How to Start or Flip and Open Access Journal.” Webinar hosted by Scholastica. 5 Dec. 2018. Workshop leader. “Teaching the English Major.” Department of English, Michigan State University. Sep. 2018. Workshop leader. “Discovering Your Writing Process and Your Academic Voice.” Department of English, Michigan State University. 6 Oct. 2017. “Falling in Love #99: Romance Comics and the Popular Culture Archive.” Reception for the Allan D. MacDougall Popular Culture Archive, University of Massachusetts Boston. 24 April 2015. Contributor, The Dissent Mixtape, produced by Mike Casiano and Molly Benitez. American Studies Association, 2017-2018. “Toward a Multiple Afrofuturism: Traditions and Localities of a Global Movement.” Critical Institutions: Absorptions, 24 Feb. 2018, Michigan State University. Discussant, Demoing unto Death: Smart Cities, Environment, and “Apocalyptic Hope.” Critical Institutions: Machines, 26 Feb. 2016, Michigan State University.